Note: The below is an adaptation of an article that was first published as ‘If it’s not about elephants, it’s irrelephant! 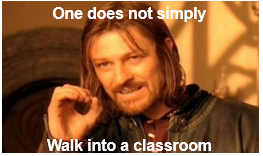 Memes for teaching early years’ in IATEFL’s YLT SIG Journal ‘C&TS Digital’, Issue 2, 2015. At last year’s International House DOS Conference, I was scheduled to present at the same time as the one and only Nick Kiley. As we were joking about swapping rooms to confuse people (the thought of them saying “I wanted Kiley, not Kylie” was somehow much more amusing at the time) we discovered that although our sessions couldn’t have been more different, we had both included a slide with an elephant. Naturally, we continued to joke, but now about who had the better elephant. Overhearing our banter, the lovely Dave Cleary from IH Brno, who was sitting in front of us, swiftly turned around and chimed in with “Well, she is the elephant lady”. This wasn’t the first time I’d been referred to as the ‘Elephant Lady’ and actually I hope it won’t be the last. You see, despite my many hats, I’m a Very Young Learner teacher at heart. You don’t need to spend long with VYLs to realise that the classroom most conducive to learning is one that considers the aptitude and development of its learners. The concept of primacy of process and conditions over language has been present in English language classrooms since the development of methods, which emerged from Krashen’s (1981) monitor model, and although many of these ‘designer methods’ (which were quite limiting and as such drew criticism) have now lost favour, remnants can still be identified today. Asher’s (1982) Total Physical Response (TPR) movement, which drew on the work of Piaget and cognitive theory in regards to active involvement in language, in particular, continues to influence classroom practice and methodology in VYL pedagogy today. Whilst I’m not one for limiting methods, I am a big fan of getting physical in the classroom and Piaget’s theories of young learners acquiring language through movement. In fact, there is a rather embarrassing VYL training video used at International House Prague of me stomping around like an elephant with 25 pre-schoolers stomping behind me to prove it. I forget now if we had taken a ride in our magical bus (whilst singing ‘The Wheels on the bus’, what else?) to the zoo and were acting out the animals as I ‘spotted’ them, or if we were playing ‘freeze’ but doing directed animal moves instead of dancing. I only remember I was having a bad hair day. Oh, and that the children enjoyed being an elephant, monkey and crocodile the most. It’s always the same. Everyone loves the elephant, monkey and crocodile, which is why the moment I saw ‘The Elephant Story’ in ‘Drama with Children’ (Phillips, 1999), I fell in love. It’s a TPR type story with the learners using their bodies to mime and ‘act out’ lexical items from the text such as enormous, elephant, magic, monkey, crazy, crocodile, walk, New York. I know The Elephant Story by heart. I’m pretty sure I’ve introduced it to every VYL class I have taught since first reading Phillips’ book and had my learners act it out for the end of semester performance more times than I can count. It never fails to please and impress. I’ve also used the elephant story in teacher training sessions and workshops when discussing and demonstrating the benefits of physically engaging VYL in language. Numerous times. Again, it never fails to please and impress. Everyone, seemingly, loves the elephant story. And why not? It’s a lot of fun. It’s also memorable. Incredibly memorable as my opening anecdote attests! Anything not about elephants is irrelephant! Once delegates were happy with their list, I demonstrated my beloved elephant story. Well, Sarah Phillips’ Elephant Story. Everyone joined in. Everyone smiled. Everyone agreed that it’s an age appropriate, that fun and movement is crucial and that actions support remembering and internalising lexis. There was a lot of nodding. But then I asked, ‘Do you get the feeling I did the Elephant Story just because I like it?’ to which I was met with blank stares. I assume they thought it was an unusual thing to say as it does exemplify an easy and fun activity for a new-to-(V)YL teacher to have up their sleeve and it highlights relevant connections between theory and practice. But let’s be honest, I really chose the elephant story because I love it. And it never lets me down. I’m not alone, right? I think we’ve all planned lessons around an activity we like, especially one which we know works. After all, in a VYL class we have so much to consider, we can literally lose them in seconds. Effective class management is crucial for learning to occur, so why wouldn’t we draw on our most engaging activities? I genuinely believe that VYL teachers, faced with the plethora of age specific challenges they need to deal with, are especially susceptible to over-relying on tasks and materials and keeping children ‘happy’. 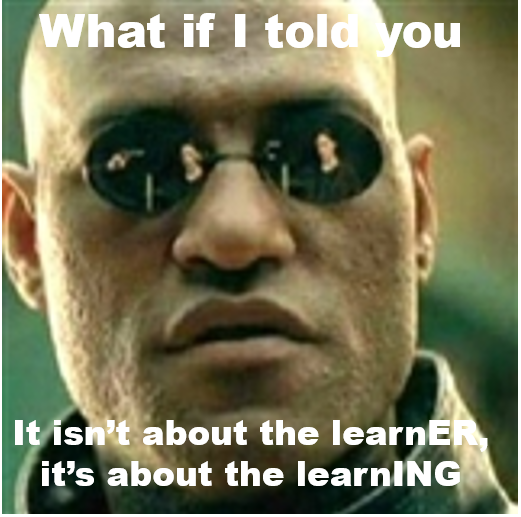 Scrivener and Underhill’s Demand High ‘meme’, as they called it, reminded me of reading Cameron’s (2001) ‘learning-centred’ approach as well as the great advice a mentor once gave me, “Don’t be afraid to ‘teach’”. There’s an unfortunate and uncomfortable myth that teaching (V)YLs is straightforward, or simple even, and that our learners only need basic language and lessons with a few games to keep them engaged. The reality, however, is that an effective (V)YL teacher needs to extend and upgrade their repertoire beyond the usual language awareness and teaching skills. It requires specialist training and expertise to understand how children learn and ways they make sense of the world. I truly believe, mirroring Cameron (ibid) that children can accomplish much more than we give them credit for and by not exploiting such potential we are doing them a disservice. So let me ask, is there an elephant in your classroom? With popularity winning the votes of the fee paying parents, are we afraid to ‘teach’? I mean really teach? I challenge (V)YL teachers everywhere to have high expectations of their learners and make reasonable adjustments and tweaks geared at moving the focus of your teaching to that moment by moment learning. As long as we (V)YL teachers are providing learners not only a positive, but meaningful and memorable language learning experience, I’m happy to be known as the ‘Elephant Lady’. Bringing elephants to the classroom and food for thought to the staffroom, one TPR story at a time! Asher, James J. and Adamski, Carol (1982) Learning another language through actions: The complete teacher’s guidebook. Los Gatos, Calif: Sky Oaks Productions. Krashen, Stephen D. (1981) Second language acquisition and second language learning. Oxford; New York: Pergamon Press. Phillips, Sarah (1999) Drama with Children. Oxford: OUP.